This tasty morsel comes direct from France and measures a hearty 21" long. 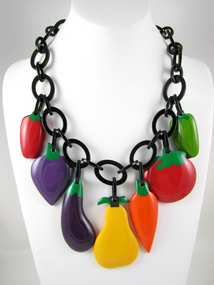 The necklace boasts 7 colorful resin charms: Strawberry, Radish, Eggplant, Pear, Carrot, Tomato and Bell Pepper. Necklace has a hook & link closure. Be sure and look for the matching Tomato earrings. Delectable.